First of all, let me say that I'm thoroughly enjoying my Cactus RF60 flash and V6 Trigger. I'm a Nikon user and I also own the SB-700 flash which has TTL HSS built in. The documentation doesn't really explain how to use the HSS Sympathy mode on the RF60 flash. Can someone explain in detail or step by step how to setup and use them in this manner? I have some photo ideas that may need me to use this feature but I'm at a real loss at this moment. With a help of the TTL flash, the RF60 is able to shoot at shutter speeds that beyond a camera's maximum sync speed (i.e. 1/160s on Canon 5D3). To use RF60 in HSS sympathy mode, you need a TTL flash with HSS / Auto FP capability. 2. Switch the RF60 Master to HSS sympathey mode by presing the "HSS" button twice. The center row of the LCD display will show HSS. This will automatically turn on the optical slave trigger in S1, which the flash is triggered by first pre-flash). 3. Position the RF60 Master with its optical sensor facing the TTL flash head. 4. Take a test shot by pressing the camera's shutter release button. With a Nikon, you also have further options. Have a look at Brian Hursey's description of how to use another E-TTL capable trigger (would be an i-TTL capable trigger in your case) in conjunction with a V6. To the best of my knowledge, Nikon cameras still generate a flash trigger signal, even when the shutter speed goes beyond the sync-speed. You should be able to go quite high with the shutter speed (and the RF60 put into HSS mode) before you need a pre-sync signal. You'll notice when the shutter speed becomes too high for this simple approach, when a black bar starts creeping in from the bottom of the frame (as you increase the shutter speed to fine the maximum value). Note that if you use the optical triggering method described by admin, you'll have to set a delay value in order to make the RF60's flash appear at the time of exposure (and not too early). You'll have to experiment a bit, but the manual gives some useful starting points. Again, unless you go too high with the shutter speeds, you won't need a pre-sync signal and should be able to simply use the "S2" triggering mode without any delay value. BTW, section 11.2 on page 32 of the RF60 manual describes how to use the HSS mode. On page 34, you'll find a step by step description followed by some notes about the required delay time (when using the pre-sync signal approach). I tried to figure this mode out for my Pentax - but I failed. Once ore twice i had a lightning effect by the RF60 on pictures - but were never able to reproduce it. That sounds like you have used a delay but did not get the value right. Note that you should be able to use "S2 MAIN FLASH" as the optical triggering method with DELAY set to "OFF" up to a shutter speed of about 1/2000s. At least that works for me with a K100D. If you want to use higher shutter speeds, you need to switch to "S1 FIRST FLASH" and then you need an appropriate delay value. The manual gives a range of values you should try. It takes a bit of experimenting to find the correct delay value for your camera and settings. I recommend setting the camera to manual mode and not change any of the settings (f-stop, shutter speed) while you are trying to find the right delay value on the V6. You should find the right ballpark using increments of 3ms (or so) and then can fine tune some more. If you use too large a step between candidate delay values, chances are you'll jump over the useful range and never see it work. Klaus, are you trying to trigger the RF60 optically (i.e., directly from an HSS flash) or from a V6 via radio? If you do the latter, make sure to disable the optical triggering for the RF60. If you switch an RF60 to HSS mode, it automatically turns on optical triggering. You will want to disable this optical triggering if you intend to fire the RF60(s) with a V6 (that itself gets optically triggered by the HSS flash). I tried it with just the RF60 and a Pentax360-HSS on the cam (set to -3 to see the additional effect. I got single results that had been ok - but I was never able to reproduce it. I thing I stap at this point because HSS with radio trigger is least important to me. Usually I use the Sigma EM140DG on the camera and trigger Pentax 360&540 by Pentax wireless mode. 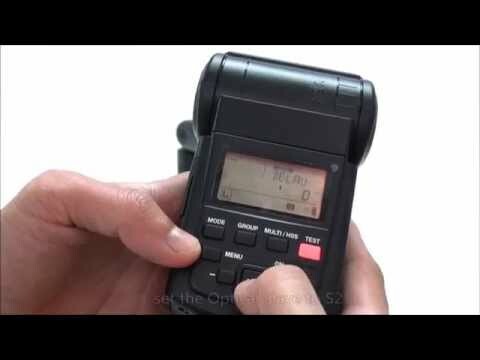 For those who are interested to set up the RF60 HSS sympathy mode, please spare just 2 minutes to watch this video. Thank you. This the another method to setup the RF60's HSS sympathy mode. This time, the RF60's optical slave is set to S2 to capture the main flash of the TTL flash after the pre-flash. I've been trying this for a while now with a Sony HVL-43M. 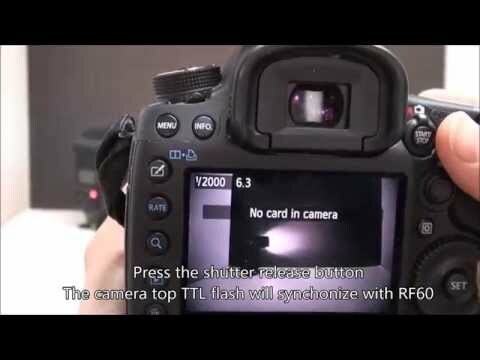 Do I need to setup the TTL flash in wireless mode? And if I don't, won't my 43M contribute to the exposure of the final photo? When I don't put it in wireless mode, I see flash from the 43M in addition to flash from the RF60. When I do put it in wireless mode, I see... black. Nothing in the photo but black. Obviously the timing is off I'd assume. I tried 90-100 delays (as the manual states for Sony), but still black. I've tried over and under delays as well... nothing. Unless your Sony flash at least issues a pre-flash, the RF60 cannot fire. I'm not a Sony user but I'm guessing that the Sony flash must not be in wireless mode since it won't fire at all in this mode (unless you are using a second Sony flash on-camera). Try to find out whether your Sony flash/camera has a controller mode in which it will issue a pre-flash but only minimally contribute to the main exposure (if at all). Note also that the RF60 can trigger on the pre-flash (in which case you need to set a delay value) or on the main flash. Make sure you have the right option selected depending on what your Sony flash is delivering. Main flash triggering will only work up to a certain shutter speed, though. Yes, my Sony is in controller mode, and I do see the pre-flash. I setup my RF60 to delay 90-100 (tried all in between) and the frame is just black (just very dark). So, there is a timing issue I'm sure. I've even tried to use my iPhone to record the flashes in slow-mo but that didn't really help decipher what's going on. I do know the RF60 is flashing. I was using the RF60 on S1 mode. I'll do some more testing tonight. Note that you can do test fires while adjusting the delay value in the menue. Also, you should be able to do progress in jumps of 3ms, you should still catch the flash when you are in the right ballpark. I have a sony a 77II and when you put it in wireless the flash goes off before the shutter opens and that should trigger the rf 60 to go off ( this is with the pop up flash not sure if this will work when you put your flash on ) good luck . How are you liking the cactus flash and trigger I am think about getting them. It works with delays from 45-51. Took a long time to figure that one out, but this is huge for me. Means the difference between the Cactus system at like 175 per flash and the Phottix system at like 400 per flash! Now I can just get more Cactus flashes for my V6! I have read Brian's blog and I wonder if this will work with my D610... And RF60... I know that I won't have TTL but would like to use manual and HSS for outdoor portraits. Also I know that HSS uses more power does the RF60 have a heat safety cut out? I look forward to the response. David, Brian's approach will work with your D610 and RF60 if you have a Nikon-dedicated HSS-capable trigger (or a Nikon-dedicated HSS-capable flash). Something needs to tell the D610 that it should use HSS (pre-sync) timing for the flash trigger signal. The V6 cannot do it on its own, but if you combine it with a Nikon dedicated trigger that supports HSS then you can use any number of RF60 as HSS flashes. The RF60 has overheating protection. There are several stages from just increasing recycling times (to provide cooling down periods) to completely shutting off. A thermometer icon will show on the display accordingly (as described in the manual). That's great thank you... So I don't need a Nikon dedicated HHS capable flash... Purely a trigger as shown and a sync cable... Is that cable PC to 3.5mm? The cable needs to have a male 3.5mm connector at the V6 end and at the other end it needs to have a connector that fits your HSS-capable trigger. I am hoping to setup my Pentax K5 with a V6 mounted on top, 2 non-TTL slave flashes (probably Cactus RF60's) on stands and shoot HSS. I did not plan to mount any flash on the camera body. The menu is set to wireless mode and the built-in flash on the K5 is disabled so as not to contribute to the lighting. Anybody tell me if this will work?? If not, what setup is recommended? The Pentax K-5 does not produce a regular trigger signal on the hot-shoe anymore, once the shutter speed goes beyond 1/180s. Have a look at the respective section in my V6 review at pentaxforums regarding the need to use an HSS-capable flash in order to make the camera use higher shutter speeds and still provide a trigger signal. The only alternative to the method described there, if you want to use HSS, is to remote trigger both RF60 and the camera via V6s, and using a delay value for the flashes to compensate for the camera lag. You'd need a shutter release cable from the V6 to the K-5 in this case. OK, that's what I thought! So, any P-TTL capable flash and V60, mounted on the camera, will enable HSS signals to my 2 off-camera RF60's. If that is correct, I suppose I could just purchase one of the cheaper Pentax flashes like the AF200FG around $40... right?? Oh... wait... I'll bet the on-camera flash also needs to be both P-TTL AND HSS cabaple, right? You are right, to get a pre-sync signal from the camera, the on-camera flash needs to support HSS. Note that this will still not enable hot-shoe triggering for the V6. You will have to trigger the V6 optically from the on-camera flash. This is possible by holding the V6 close to the flash head or by using a piece of paper or similar to guide the light into the V6's sensor. Sorry for all the questions but with Pentax flash, it seems I am going in circles for HSS compatibility. So, a V6 set to TX on-camera with lets say a Sigma EF-610 DG Super set as MASTER, a V6 set as RX on each remote RF60's set to SLAVE, and a cable release/timer from the K5 to the on-camera V6 to trigger? (Seems like an lot of equipment) Is there any remote substitute for the cable release, although my Pentax timer should suffice? Cactus should make a diagram of suggested Pentax setups for the user. There are a lot of Pentax users out there and it seems most have struggled through forums and researched this to death! You guys seem to have the solution... but I reserve judgment until mine finally works (LOL)! Thank you in advance for all the help and response. You don't need V6 receivers for the RF60's. An RF60 has its own built-in radio receiver/transmitter. You don't need a cable release either. The K-5 does not generate a sync-signal anywhere. Optical triggering (of a V6 or the RF60 directly) is your only choice, unless you use a completely different approach. Using the manuals and perhaps my reviews, you should be able to get this working. 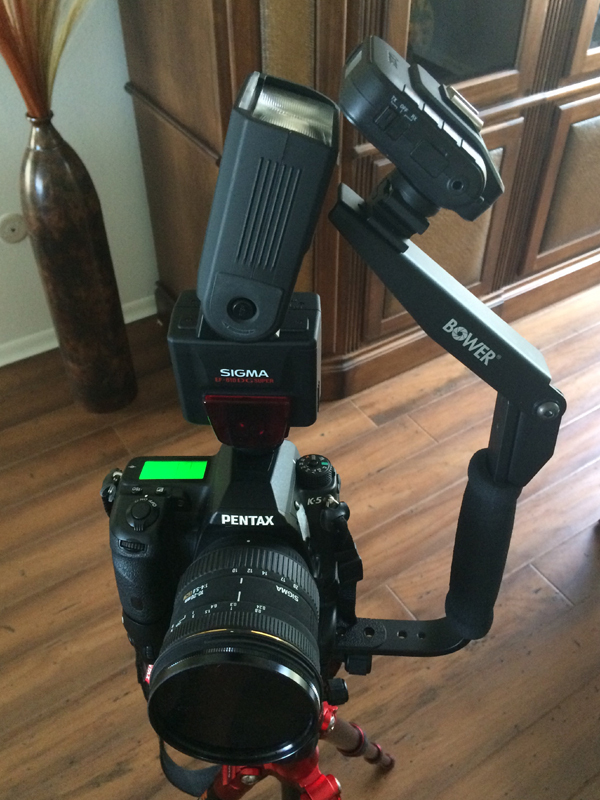 FINALLY... HSS working on Pentax K5 with Sigma EF 610 DG Super as trigger and RF60 slave. Took a while to understand the optional setup recommended but came up with a Bower bracket mod that made it all work fine. One question remains, Sigma 610 has max ISO of 1600, is this going to limit my camera setting to 1600?? I have been playing with your alternative setup using a second V6 to trigger the on camera V6 with trigger release cable from camera to V6 sync port to fire the V60 on a stand 15ft away set to 91ms delay (also tried 94) and HSS. ISO 400 f4.5 at 1/200, or 1/500 and although flash fires remotely, total black frame. Is it possible the K5 is at fault or am I missing something?? For the alternative approach to work the delay time has to be set only on the RF60, have you done that? Note that all units involved (including) RF60 must be on the same channel and the groups the RF60 and the V6 connected to the camera are assigned to must be active on the V6 in your hand. Just for troubleshooting purposes I would remove the V6 triggering the camera from the hot-shoe. IIRC, it can sit on the hot-shoe with no ill-effect, but for troubleshooting I'd remove it. Also make sure there is no other flash firing. When in HSS mode the RF60 automatically activates optical triggering so can be triggered by other flashes unless you manually deactivate optical triggering in the menu. If none of the above make a difference, try different delay values, jumping in 2ms steps.